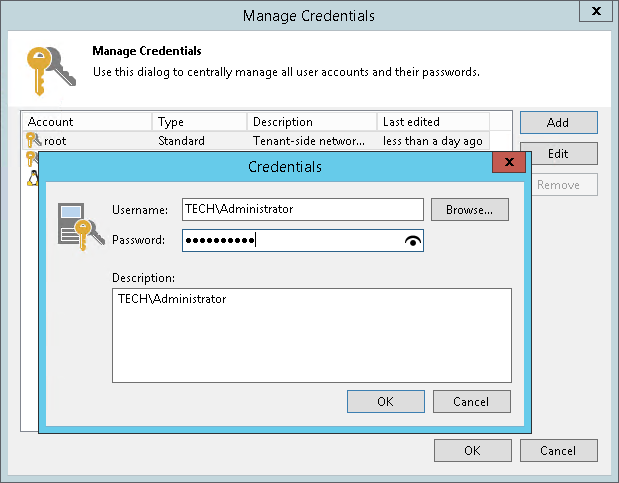 You can create a credentials record for an account that you plan to use to connect to a Microsoft Windows server or VM running Microsoft Windows OS. Click Add > Standard account. In the Username field, enter a user name for the account that you want to add. You can also click Browse to select an existing user account. In the Description field, enter a description for the created credentials record. As there can be a number of similar account names, for example, Administrator, it is recommended that you provide a meaningful unique description for the credentials record so that you can distinguish it in the list. The description is shown in brackets, following the user name.